“A blessing in disguise”, this is what I would call my trip to Jodhpur. For some official purpose I was told by my boss to visit Jodhpur. I was scheduled to stay there for two days for a business meeting but when I reached there I got to know that because of some unavoidable reasons the clients who I had to meet would be one day late. So my good fortune sneeked me one whole day to pursue my passion-travelling. 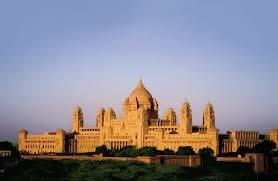 Popularly known as the “Blue City”, Jodhpur has amazing attractions to offer. On our way to the famous Mehrangarh fort, my guide Rakesh told me that Jodhpur is called a blue city because during the bygone era blue color was used to demarcate the houses of the Brahmin castes. And the other interesting reason he told was- blue color keeps the biting ants away. Interesting! Dominating the landscape of the city, Mehrangarh fort is dramatically perched on a hill. As we were moving inside the fort, Ramesh told me interesting legends associated with the fort. The fort was built by the founder of the city, Rao Jodha, in the year 1459. Inside the fort I saw several mesmerizing structures with exquisite carvings and embellishments- Moti Mahal (Pearl Palace), Phool Mahal (Flower Palace), Sheesh Mahal (Mirror Palace), Sileh Khana, and Daulat Khana and museum. It was great to visit the museum where I saw a collection of royal cradles, music instruments, miniature paintings, palanquins, howdas and the famous Kilkila cannon. My next halt was the grand Umaid Bhawan Palace (now a heritage hotel), one of the India’s fascinating palaces. 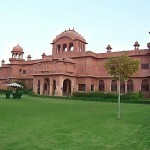 Sprawling over 26 acres of land, this palace was once the largest residence in the world. I went to see its museum where I saw a variety of weapons, clocks stuffed leopards, and a huge banner presented by Queen Victoria. In the evening I explored the colourful and bustling bazaars of Jodhpur. The bazaars were spilled with a variety of handicrafts such as tie and dye fabrics with silver and golden embroidery, paintings, leather crafts, wooden articles, furniture, silver jewelery and juttis. I bought two beautiful paintings. This marked the end of my short but sweet journey to Jodhpur buy flagyl online. For the next two days I remained busy with the clients for offical purposes. «Next Post Sand Dune Safari in Jaisalmer- An Overwhelming Experience!